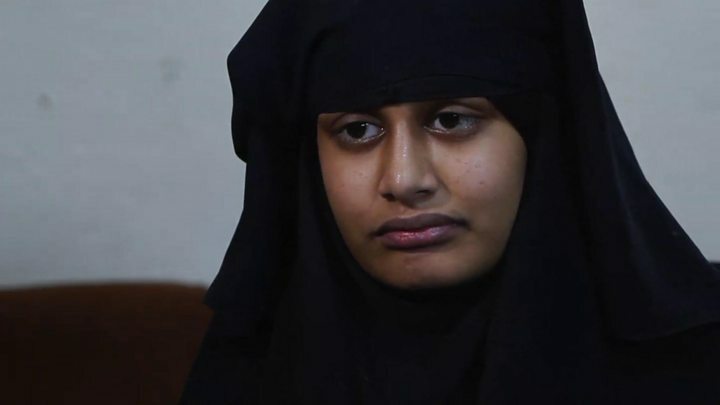 The baby son of Shamima Begum - who fled London to join the Islamic State group - has died, a spokesman for the Syrian Democratic Forces has said. The group, which runs the camp where the teenager has been living, confirmed the death on Friday. The spokesman said the government had consistently advised against travelling to Syria and would "continue to do whatever we can to prevent people from being drawn into terrorism and travelling to dangerous conflict zones". Ms Begum left the UK in 2015 with two friends and was found in a Syrian refugee camp in mid-February. She wanted to return to Britain but was stripped of her citizenship. Her husband, a Dutch IS fighter called Yago Riedijk, is being held at a nearby prison and has been informed of the baby's death. What was life like for the IS couple? A paramedic working for the Kurdish Red Crescent in the camp told the BBC that the baby, called Jarrah, had been suffering from breathing difficulties. Ms Begum has since returned to the camp and her child was buried there yesterday. Speaking to the BBC before it was confirmed that the baby had died, Home Secretary Sajid Javid said: "Sadly there are probably many children, obviously perfectly innocent, who have been born in this war zone. "I have nothing but sympathy for the children that have been dragged into this. This is a reminder of why it is so, so dangerous for anyone to be in this war zone." Ms Begum, 19, gave birth to her son last month, shortly after being tracked down by a journalist in a Syrian refugee camp. She had reportedly left Baghuz - IS's last stronghold. Ms Begum said she had previously lost two other children and named her newborn son Jarrah after her firstborn. Media caption"I got tricked and I was hoping someone would have sympathy with me"
As her child was born before she was deprived of UK citizenship by the Home Office, the baby would still be considered British. Mr Javid previously said that the revocation of Ms Begum's citizenship would not apply to her son, explaining: "Children should not suffer, so if a parent does lose their British citizenship it does not affect the rights of their child." The lawyer representing the family of Ms Begum, Tasnime Akunjee, also confirmed the death. 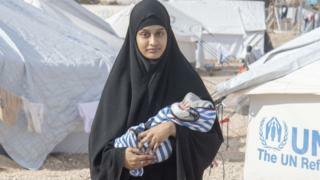 In an interview with the BBC after the birth of Jarrah, Ms Begum said she did not regret travelling to Syria - although she added that she did not agree with everything the IS group had done. She also said that she never sought to be an IS "poster girl" and simply wished to raise her child quietly in the UK. After Ms Begum was stripped of her citizenship, her family wrote to the home secretary to say they planned to challenge the decision and asked for assistance to bring her baby to the UK. BBC home affairs correspondent Daniel Sandford said it might have been possible for the government to get the baby out of Syria, although that could have been "politically difficult". "The government's position that it's impossible to go and get people out of these camps because it's too dangerous is repeatedly shown to be not entirely accurate, because journalists are able to get to these camps relatively safely. "Working with the Red Crescent there for example, it should be possible to go and get people from the camps if there was a political will." Dal Babu, a former Metropolitan Police chief superintendent and friend of Ms Begum's family, told BBC Newsnight: "We've failed, as a country, to safeguard the child. "This was an entirely avoidable death of a British citizen. The family reached out to the Home Office, requested help, the Home Office sent a reply saying you've come to the wrong department. "There was no attempt to help by the Home Office. I think it's shocking how the home secretary has treated this situation." Shadow home secretary Diane Abbott also criticised the actions of the Home Office. She tweeted: "It is against international law to make someone stateless, and now an innocent child has died as a result of a British woman being stripped of her citizenship. This is callous and inhumane." Kirsty McNeill, head of policy, advocacy and campaigns at the charity Save the Children, said "all children associated with IS are victims of the conflict and must be treated as such". She added: "It is possible the death of this baby boy and others could have been avoided. The UK and other countries of origin must take responsibility for their citizens inside north-east Syria." Who will take the IS couple?